What does a gardener do to fulfill her creative urges when the garden is denied her? She writes about gardening, when she's not too busy bemoaning the winter weather which she so coveted in years past. She peruses plant and seed catalogs in anticipation of the return of spring, creating amazingly beautiful gardens in her mind or on paper. But what does she do when that's not enough? When she sees her garden as a canvas with plants as the colorful brushstrokes and her longing to once again paint with plants cannot be contained, does she race out to the nearest nursery and throw caution to the winds, or does she find other outlets? Even she is surprised at the answer! Last night a group of 7 friends and I ventured into midtown Houston to visit what may be the best venue around for a ladies' night out. Pinot & Picasso is located at the intersection of Fairview and Taft in an unassuming, slightly shabby, storefront. You bring the wine, they supply everything else you need to create a masterpiece, including step by step instructions and some great background music that causes some ladies to break out in song and dance. Think you can't create a painting in 2 hours (especially under the influence of a little vino)? It's a pleasant surprise to find that you can. This was not my first time at Pinot & Picasso, nor will it be my last. I should note that on my first visit, quite a few men participated; the one lone male in last night's class seemed to enjoy himself nonetheless. The classes fill up pretty quickly, with some paintings more popular than others. If you want to grab some dinner before your class, there are several restaurants in the general area (we chose Pronto Cucinino on Montrose). And if you're in the mood for dessert afterwards, all of us recommend The Chocolate Bar on West Alabama. 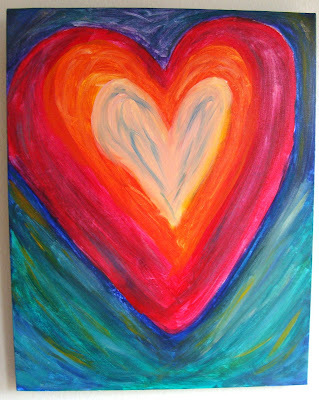 I like my painting well enough to hang it in the powder room along with the other hearts I've collected over the years. When I see it, I'm reminded to TAKE HEART ... it won't be winter forever. That sounds like a ton of fun. I once did a paint-your-own-pottery thing with some girlfriends, which was fun. I like your painting! I'm not an artist at all, Cindy, but your painting is beautiful--very Van Gogh-like! And this sounds like so much fun, especially ending the night at a Chocolate Bar!